Asthma and allergies have increased greatly in much of the world in recent decades, reaching levels that are commonly referred to as epidemic. According to an author from the U.S. National Center for Health Statistics, "why these allergies are on the rise remains a mystery." According to the American Academy of Family Physicians, breastfeeding of infants was relatively rare in the United States in the middle of the 20th Century. (9b) But it started increasing rapidly in 1972 and had become typical infant feeding by the end of the 1970's; and breastfeeding rates continued to increase into the 2000's. When the movement promoting breastfeeding was building up, the case in favor of it was very strong on the basis of what was known at the time. A number of studies were done, most of which concluded that breastfeeding was beneficial, including apparently reducing risk of allergies and asthma. The focus at that time was on effects during very early childhood, and it was assumed that the beneficial effects detected at the early ages would mean overall benefits to the child. It was only in the 2000's that a large number of studies found that what had initially seemed beneficial turned out to be detrimental in the long run. According to the NIH (www.ncbi.nlm.nih.gov) ”an allergy is an immune response or reaction to substances that are usually not harmful." The most common type of asthma is allergic asthma. Therefore proper functioning of the immune system is central to discussion of both asthma and allergies. The modern sanitation that greatly reduced our microbial exposure in developed countries, as compared with the exposure that our bodies became adapted to during almost all of human history, came about in the late 19th and early 20th centuries. But the epidemics in allergies and asthma arose in the late 20th Century. It appears that, for several decades after modern hygiene was achieved, the remaining microbial exposure of infants was still sufficient to provide the stimulation that immune systems needed in order to develop properly. Then something seemed to change, approximately during the 1970's, which increasingly left infants' immune systems failing to develop properly. It is undisputed that there are immune cells in breast milk, which destroy microbes. It is entirely possible that a major increase in infant ingestion of those immune cells (such as would have occurred during the rapid increase in breastfeeding beginning in 1972) was what tipped the balance of microbial exposure over to insufficiency, for a large and increasing number of infants. The immune cells in human milk are helpful to the health of a very young child. But it should be expected that they would reduce the microbial challenges that otherwise would be stimulating the optimal development of the child's own immune system. Studies that focus on the health of very young children would be expected to find benefits of breastfeeding, whereas studies that look at longer-term effects would be expected to find something different, which is exactly what seems to have happened. In a 2011 U.S. study (see data Table 2 on right), 739 young children (up to age 6) were found to have far higher levels of food sensitization with greater age. (11j) Note that before age 2, the increase in allergies (OR's above 1.0) for the breastfed children were small; but for children past age 2 the increases in allergies associated with breastfeeding became quite large. In both cases, the increases in allergies were greater for children who were breastfed for longer durations. In a 2004 Danish study of 15,430 mother-child pairs, it was found that, although overall current breastfeeding was not associated with atopic dermatitis, exclusive breastfeeding for at least 4 months was associated with an increased risk of atopic dermatitis in children with no parents with allergies. (IRR (incidence rate ratio)= 1.29). (11f) Note that this substantial but relatively moderate increased risk of atopic dermatitis was assessed at only 18 months of age, which was very young by comparison with the studies that followed up at later ages and found higher risk ratios for breastfeeding. In a 2005 New Zealand study, which assessed 550 children at 3½ years of age, 87 of whom were diagnosed with AD (atopic dermatitis), the odds ratios for AD were 6.13 and 9.7 respectively for children with less than 6 months or more than 6 months of breastfeeding, as compared with children who were never breastfed. (11e) Here again, as in other cases, there was a conspicuous dose-response relationship, with greater exposure to breastfeeding apparently leading to greater amounts of allergy. In a German study of 1314 infants born in 1990, analyzing the effect of any breastfeeding duration on the prevalence of atopic eczema, it was found that the prevalence of atopic eczema in the first seven years increased with each additional month of breastfeeding. (11a) Again, a dose-response relationship, and a finely-tuned one at that. To summarize: There is good evidence indicating health benefits to a child of breastfeeding while the breastfeeding is taking place, and probably for a few months following weaning. But the evidence appears to be overwhelming that the medium- and long-term effects of breastfeeding regarding asthma and allergies are adverse. The above studies are only part of the evidence for the above relationship. To be shown below (in Section 4) is considerable historical health data helping to verify the above. Bearing in mind the link between asthma and tobacco smoke, note that a 1998 study (of 330 mother-infant pairs) found that "breast-fed infants of smoking mothers have urine cotinine levels 10-fold higher than bottle-fed infants whose mothers smoke. "11r3 (Cotinine is a marker for smoke exposure) So it appears that the results of smoke in the air are dramatically increased due to the strong concentrating effect of the lactation process, taking in moderate doses of environmental contaminants and transferring them to the infant in far more potent form. This would almost certainly apply in the case of other atmospheric contaminants also. However, there was in actuality no good reason to doubt the established beliefs about the underlying environmental toxins. Those toxins are apparently harmful only if the child's immune system is not well developed; and apparently there were fewer children in the former Iron Curtain countries with impaired immune systems. It is apparently not common knowledge, but is nevertheless true, that breastfeeding rates were very low in the Soviet-controlled states as long as that control continued. (see footnote 8fa at www.breastfeeding-and-diabetes.info. See Section 1 about negative effects of breastfeeding on development of the immune system, and also see Section 2 for ample evidence that breastfeeding leads to increased asthma incidence, especially as the breastfed children become older. The studies finding surprisingly-low asthma prevalence in the former Soviet lands were published in 1992 and 1994, reflecting apparent effects of the low breastfeeding rates that had prevailed during the infancies of the children who were surveyed. So there appears to be no reason to question the well-observed connection between pollution and asthma, if one is aware of why the percentage of children with compromised immune systems can vary substantially between regions with different breastfeeding rates. For the period from 1969–1970 to 1994–1995, Newacheck and Halfon (2000) reported that the prevalence of disabilities related to asthma among U.S. children (based on the National Health Interview Survey) increased 232%. 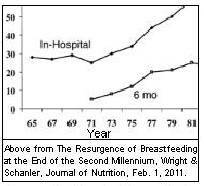 (12) Notice how compatible that is with the increases in breastfeeding rates that took place during those years. In Figure 2, below, observe the rate of hospitalizations for asthma for 0-to-4-year-olds, those most closely affected by the increases in breastfeeding: Serious cases of asthma increased over 60% from 1980 to 2004, a period in which effects of the transition to much higher breastfeeding rates would have been occurring. c) no consistent decline or increase among those affected by increased breastfeeding but well separated from it (the 5-14 age group). Compare the above with the over-60% increase in serious cases of asthma among the age group with the closest exposure to breastfeeding. The difference in asthma hospitalizations between those closely affected by the increases in breastfeeding and those unaffected by it is huge. And it is quite noteworthy that the remaining age groups were distributed between the opposite extremes in proportion to how much and how closely they were affected by the increases in breastfeeding. When noticing that there was no consistent trend in asthma hospitalizations in the 5-14 age group, note that this is not an indication of lack of long-term effects from the increases in breastfeeding that had taken place during their infancies. That lack of trend should be compared with the 42% decline that took place among the age group that was unaffected by the increases in breastfeeding. A major decline is apparently what should have been expected, given advances over the years in methods of treating this disease. Something other than a major decline probably reflects something having gone wrong for that age group. 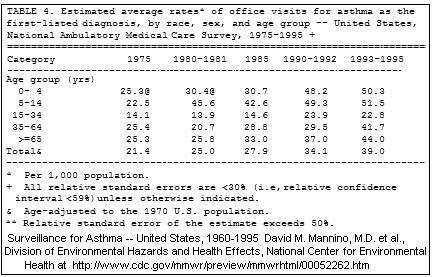 Unfortunately there is little data available about asthma prevalence in the U.S. before 1980. This chart shows what seems to be the best of what is available. Notice here that, among all people unaffected by the increases in breastfeeding as of 1980 (those age 15 and older), office visits for asthma were either stable or declining between 1975 and 1980-1981. But observe again what happened among those most closely affected by the increases in breastfeeding (the 0-4 age group): there was a substantial increase in that period, suggesting the likelihood of an increase in an exposure that infants, specifically, would have received. One very likely such exposure would have been immunological harm resulting from the increases in breastfeeding that occurred when these children were infants. Asthma rates as shown in Figure 3 above also increased substantially (50-65%) among adults during the years shown, but those increases were far less than the increases (doubling and more) among the age groups that were heavily affected by the increases in breastfeeding. The chart below considerably updates the above charts, while showing continuation of the same relationships observed above. Note that outpatient hospital visits for children increased by 24% during the few years between 2001-2003 and 2007-2009, while such visits by adults over age 35 declined by 20%. This is a repeat of the pattern shown at the beginning of this section, in which those who were heavily exposed to the increases in breastfeeding had rapidly increasing asthma at the same exact time as those with very little or no exposure to breastfeeding had declining rates of asthma. Table 19 just above also shows similarities to the earlier pattern with regard to deaths from asthma. Although the overall trend is downward during this period, again we see a vastly less favorable trend among those greatly exposed to breastfeeding as compared with those who had very little or no such exposure: a 5% decline as opposed to a 27% decline in deaths. It is also revealing to see how closely the changes in asthma rates among black children correlate with earlier changes in breastfeeding. The CDC points out, "The greatest rise in asthma rates was among black children from 2001 through 2009" (almost a 50% increase), whereas the increase in asthma among U.S. children overall during that time was only about 10%. (17) Having read of that remarkably high increase in asthma only among black children in 2001-2009, then note the huge change in breastfeeding rates that took place only among black women during the period leading up to that increase: those rates increased "among non-Hispanic black women from 36% in 1993-1994 to 65% in 2005-2006." By contrast, changes in breastfeeding rates during that time period in the only other ethnic groups reported on were far smaller (62% increasing to 79% among non-Hispanic whites, and 67% increasing to 80% among Mexican-Americans);(18) those comparatively minor increases were compatible with the minor increases that took place in asthma in those other groups, during the time period under consideration. Atopic dermatitis is a form of skin allergy. Notice in this CDC chart what has been happening in prevalence of allergies as breastfeeding rates have been rising, including a 37% increase in food allergies and a 65% increase in skin allergies for the 0-4 age group in just 12 years. Note, in Figure 1 above, that the increase in the U.S. breastfeeding rate at six months shown for the years relevant to that period (1995 to 2010) was 57%. For the period before the years shown in the above chart, the CDC apparently does not provide data, but the following from an article in the New England Journal of Medicine fills in as follows: (as published in 2008) "The prevalence of atopic dermatitis has doubled or tripled in industrialized countries during the past three decades, affecting 15–30% of children. "(20) That doubling or tripling over that time period bears a close resemblance to the increases in breastfeeding during the years that would have been relevant, as seen in Figures 1.
a) The amounts of the increases in breastfeeding rates were compatible with the amounts of increases in asthma. b) The times of the variations in breastfeeding rates generally tracked accurately ahead of the times of the changes in asthma prevalence, individually by age group for various different age groups as described above; and those increases came at the same times during which asthma rates were uniformly declining among those age groups not affected by the changing breastfeeding. c) As indicated in Section 1 above, there is excellent biological evidence for seeing harmful effects of breastfeeding in contemporary developed countries on development of children's immune systems, which are central to vulnerability to asthma and allergies. d) As indicated in Section 2 above, many studies have found substantially increased levels of asthma and allergies among those who were more highly breastfed, especially as they became older. (3b) "Atopic dermatitis" Bieber T N Engl J Med. 2008 Apr 3; 358(14):1483-94. Jedrychowski W, Galas A, Pac A, Flak E, Camman D, Rauh V, et al. "Prenatal ambient air exposure to polycyclic aromatic hydrocarbons and the occurrence of respiratory symptoms over the first year of life." European journal of epidemiology. 2005;20:775–82. Weisglas-Kuperus N, Vreugdenhil HJ, Mulder PG. "Immunological effects of environmental exposure to polychlorinated biphenyls and dioxins in Dutch school children." Toxicol Lett. 2004;149:281–5. Guo YL, Lambert GH, Hsu CC, Hsu MM. Yucheng: "Health effects of prenatal exposure to polychlorinated biphenyls and dibenzofurans." Int Arch Occup Environ Health. 2004;77:153–8. Vos JG, Moore JA. "Suppression of cellular immunity in rats and mice by maternal treatment with 2,3,7,8-tetrachlorodibenzo-p-dioxin." International archives of allergy and applied immunology. (11h) Maternal asthma status alters relation of infant feeding to asthma in childhood. (8k) Lack of association between early exposure to cow's milk protein and beta-cell autoimmunity. Diabetes Autoimmunity Study in the Young (DAISY) Norris JM et al., JAMA. 1996 Aug 28;276(8):609-14. 2001 Feb;68(2):107-10. IDDM and early exposure of infant to cow's milk and solid food. Esfarjani F et al., National Nutrition and Food Technology Research Institute, Shaheed Beheshti University, Tehran, IR, Iran. (8m) IDDM and early infant feeding. Sardinian case-control study. Meloni T et al., Diabetes Care. 1997 Mar;20(3):340-2. Istituto di Clinica Pediatrica e Neonatologica, University of Sassar, Italy. (8o) The relation of early nutrition, infections and socio-economic factors to the development of childhood diabetes. Telahun M et al., Department of Paediatrics and Child Health, Faculty of Medicine, Addis Abeba University. Ethiop Med J. 1994 Oct;32(4):239-44. (11z) Prevalence of asthma and atopy in two areas of West and East Germany. von Mutius E, Martinez FD, Fritzsch C, Nicolai T, Roell G, Thiemann HH. Am JRespir Crit Care Med 1994;149:358-64. (12a) “New Asthma Estimates: Tracking Prevalence, Health Care and Mortality,” NCHS, CDC, 2001. (16) "Environmental toxicants and the developing immune system: a missing link in the global battle against infectious disease?" Bethany Winans, et al., Reprod Toxicol. 2011 April; 31(3): 327–336. See footnote 10 for details. (16b) http://fooddrugallergy.ucla.edu/body.cfm?id=40 "About Allergies/ Why Are Allergies Increasing?" (18) "Breastfeeding in the United States: Findings from the National Health and Nutrition Examination Survey, 1999-2006"
(20) "Atopic dermatitis" Bieber T N Engl J Med. 2008 Apr 3; 358(14):1483-94.